Our waters and nature are certainly enriched by the noble or European crayfish but for several reasons they are not doing very well (water pollution and pests). It is an invertebrate of fresh waters and an omnivore. The young are mainly herbivores, for the older the energy need increases and so they start hunting for animal prey. The shell of young individuals is frequently exchanged for a larger one as they grow. 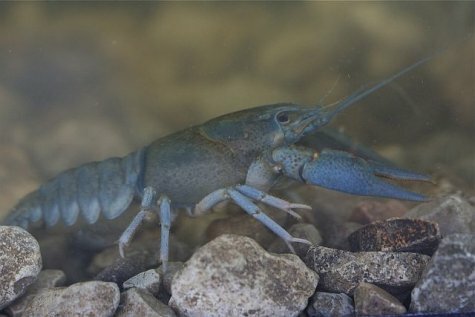 The new shell is leathery soft to start with, but becomes harder from the calcium stored in the organism of the crayfish. Additional calcium is provided by lime-rich waters. With the exchange of shell torn-off limbs regenerate too. New ones grow instead, noticeably smaller during the first few years, but with time becoming almost normal and proportional in size. The European crayfish has five pairs of appendages or legs, the first pair has developed into claws (chelipeds or pinchers) and the four hind pairs are so-called walking legs. The body consists of nineteen joined segments. The head and breast segments together make up the cephalothorax that is covered by a common shield, carapace. The segmented hind body or abdomen is pliable and ends with a tail fan, telson. The colouring of crayfish depends on many things: the colour of the bottom of the water body, heredity ... In waters with abundant vegetation they are bluish-black, in waters with a sandy bottom they have a lighter-coloured shell; in waters with a muddy bottom the crayfish cannot live. How to distinguish between males and females? The males have larger pinchers, the females a longer abdomen, broader and flatter, but these characteristics may deceive. For certain the males have on their ventral (belly) side, at the joint between the thorax and the back shield, swimmerets that are lacking in the female. A crayfish catcher must definitely look for these and note it in the catch account. The permitted fishing period lasts until the end of August. Crayfish mate in autumn, in the second half of September, but frequently in October when the water temperature goes under ten degrees. The young crayfish that were hatched this year grow to two and a half centimetre until autumn. Males become sexually mature at three years of age, females at four; they are then still less than ten centimetres long. The minimum length for crayfish that can be caught is ten centimetres which ensures that the young crayfish can at least continue their species once in their home waters. Of our water bodies 30 % of the lakes and only 15 % of running waters are suitable for the European crayfish.